Someone can help me with the lens flare? I tried copying what's in the file island.blend but it does not work, where am I wrong? I was just looking at the island demo. I see the lens flare you are talking about. I will have to look in a blend file to see if I can figure out how they did it. That may have been animated along with the camera animation. I will try to pull apart the blend file later today to see if I can figure it out. Thank you su much for your reply. This is the explanation found in the manual. Lens Flare object is used for the actual rendering of the effect. In essence, such an object consists of several planes with each plane containing one element of the flare. The normal vector of each plane should be pointed in the -Y direction. Every element can slide across the screen in relation to camera rotation with the sole exception being the central plane (bright white “star” on the picture above). This plane serves as a center of the lens flare object and should have a local Y coordinate set to 1. The placement and spatial orientation of the object itself are not taken into account during rendering. For lens flare object to work correctly, the Disable Frustum Culling option should be activated. An example of such object can be seen, for example, in our Island demo. Also make sure you have a Sun lamp in your scene. Did I put it in, do you need any setting for the sun or the camera? I was wrong: it actually works with Sun, Spot and Point lamps as well. Here is my setup: I just appended the lens flare object to the default Blender scene, and rotated both the camera and the lamp a bit. So I guess there is something else that prevents you from seeing it. Can you attach here a minimal example file? Hi guys, I also did some tests with the yuri file, and I understand a few things. it worked, but I still have some issues that I do not think are solvable. 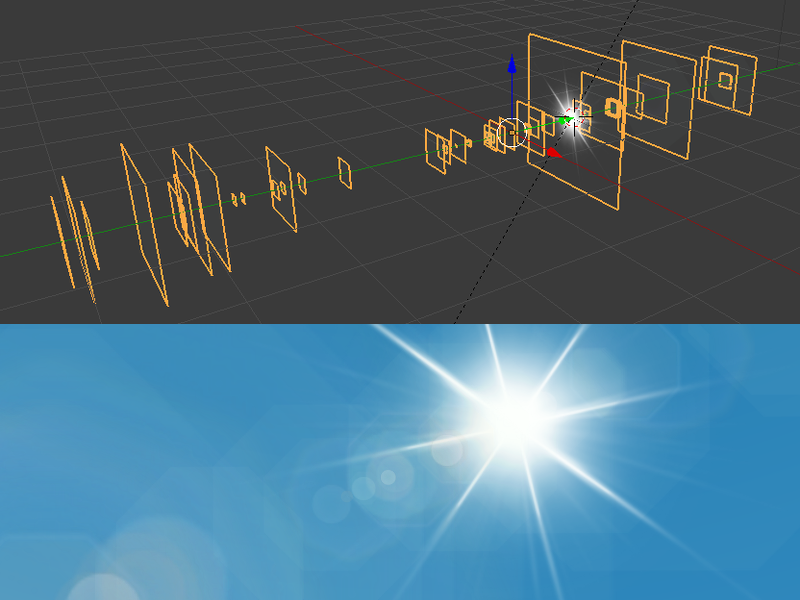 First I have to match the flare with the sun of an environment map and even if I position it exactly in the sun position, the flare appears moved. Finally the map environment is mapped to a semisphere that rotates slowly, so I should relate the flare with the semisphere, but if I do it the flare disappears. I do not think there is a solution, or I'm wrong? Could you edit the sun out of your environment map and just use the sun effect that Yuri used?